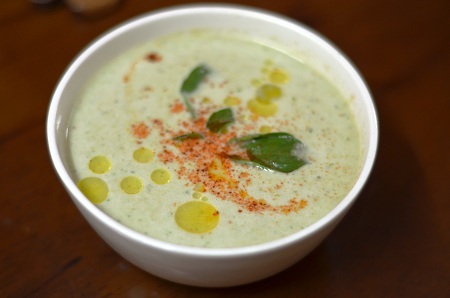 Apart from salads and juices, a cold soup is yet another wonderful way to beat the heat this summer. In fact, the heat is getting so bad right now that none of us at home feel the urge to have anything complicated. We have therefore decided to survive on soups, salads and juices for as long as we can. I started with several rounds of tomato gaspazcho this summer, and gradually moved towards more simplicity around things at hand. This soup could have been anything, had I not emulsified it with olive oil. But then again, what’s in a name. Blitz together chopped cucumber with yogurt, garlic, basil and some water to thin it down to desired consistency. Add bread slices to adjust the consistency of the soup.